David Sisk, a native of Pittsburgh, Pennsylvania, began early musical study with Duquesne University’s City Music Center program, studying with the late Matty Shiner and Robert Hammrick. David earned his BM from Youngstown State University, studying there with Dr. Michael Crist and Paul Ferguson, and his MM at The Manhattan School of Music where he studied with David Finlayson. His other teachers include Milt Stevens, Keith Jackson, Jay Ashby, and Les Dean, Sr.
David has performed with The Youngstown Symphony Orchestra, The Pittsburgh Symphony Orchestra, The Fairfax Symphony Orchestra, The DiCapo Opera Orchestra, The Airmen of Note, and The Tommy Dorsey Orchestra (under the direction of Buddy Morrow). David has also been a performer and soloist at festivals such as the ITF and the Eastern Trombone Workshop. 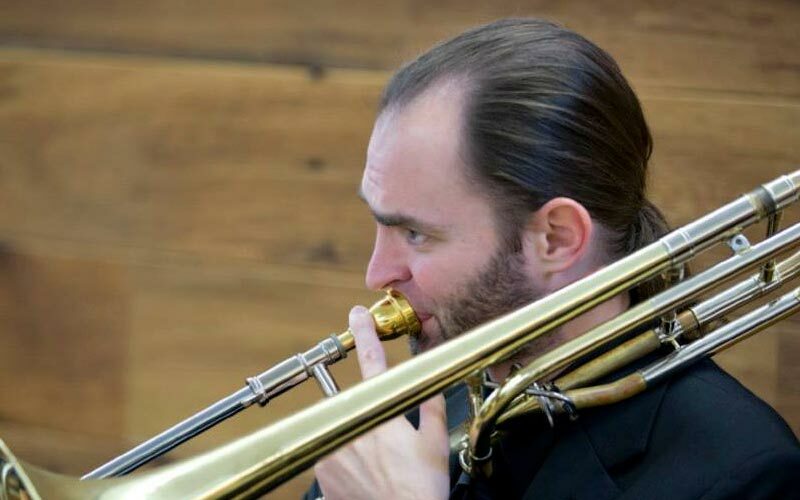 As a soloist, David won the 1999 Larry Wiehe Solo Competition sponsored by the International Trombone Association performing Arthur Pryor’s Blue Bells of Scotland at the ITF SUNY-Potsdam. David is the former second trombonist of The United States Air Force Concert Band in Washington, DC, a position he occupied from May of 2001-2009.